Most of the new lodges have hot water running straight through the pipe. Other extraordinary camps have water bucket on the outside on the roof. 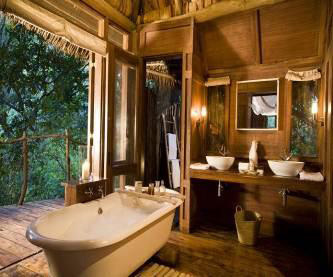 Your personal ranger, when about to return to camp after your evening safari, advises your personal butler to start preparing hot water enough for the length of two nice showers, whether you want to shower alone or with your love one. The magic moment of peace!